Susanne Sulby in Sanctuary. Photo by Carol Rosegg. 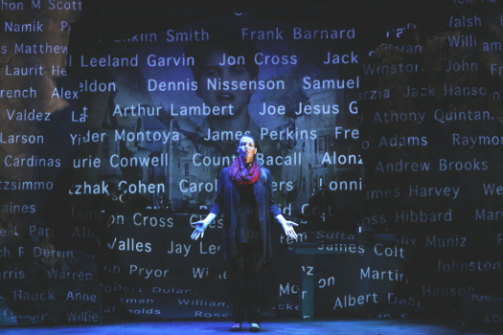 BOTTOM LINE: A one-woman show with compelling visual design and projections examining female experiences of war. Solo-vehicle Sanctuary, written by and starring Susanne Sulby, is a multi-character examination of war across the globe, an emotional collage charting the ubiquity and impact of war. Through sharing the experiences of a suburban mother, a war correspondent, a POW, a solider, and a host of other grieving characters, Sanctuary sees itself as a call to action. However, this message of the play is muddled due to a lack of character development. The main heroine of the evening is a suburban mother who clearly lives a comfortable upper-middle-class life. While I wanted to empathize with her, it was hard to feel for our narrator’s pain when she lives such a safe and privileged existence. Thankfully, Sulby is an open-hearted and sincere performer who is able to draw us in as the suburbanite asks the central question of the play: can we, people at home, do anything to stop war? This is a great question to pose, yet Sulby’s script fails to answer with any tools or resources. At one point the suburban mother writes a letter and sends a care package to the troops abroad, while another character speaks at a rally. Although these are nominally ways to get involved, they feel glib. This lack of specificity carries throughout the entire play. We meet a captured woman in Kosovo wracked with pain. We meet a disillusioned war correspondent eager to eviscerate the public’s apathy. We jump from the Serbian War, to the ‘90s Afghanistan conflict, to the invasion of Iraq, to the Syrian refugee crisis, to the genocide in Darfur, to the Vietnam War, and even to World War I. All of this is well-intentioned and heartfelt, but fails to go deeper than surface level characterizations. It seems like Sulby has bitten off more than she can chew. Her impulse to criticize war’s impact is spot on, but I would have loved to see a play that had a more specific focus. The real star of this production, however, is the design. Set between two imposing cliff faces, the set is a sleek suburban kitchen, brilliantly juxtaposing danger and safety. Kudos to set designer Peter Tupitza for telling such a clear visual story, although my hat really goes off to the projection designer, Olivia Sebesky. Flying through graphic war zones, expressionistic heaven-scapes, and a truly breathtaking night sky, these are some of the best projections I’ve ever seen. Coupled with the evocative sound design by Howard Fredrics, this is an extremely successful use of multimedia. Ultimately, while this play is well intentioned, it does not feel like a productive piece of theatrical activism. Sulby’s performance, while graceful and rich, is not enough to make her characters more than stereotypes. However, if you are interested in seeing some truly excellent theatrical projections, Sanctuary will be worth your while. Sanctuary is written and performed by Susanne Sulby. Directed by Stephen Stahl. Scenic Design is by Peter Tupitza. Costume Design is by Heather Stanley. Lighting Design is by Ryan J. O'Gara. Sound Design is by Howard Frederics. Projection Design is by Olivia Sebesky. Stage Manager is Jeff Meyers. Assistant Stage Manager is Jill Woodward.